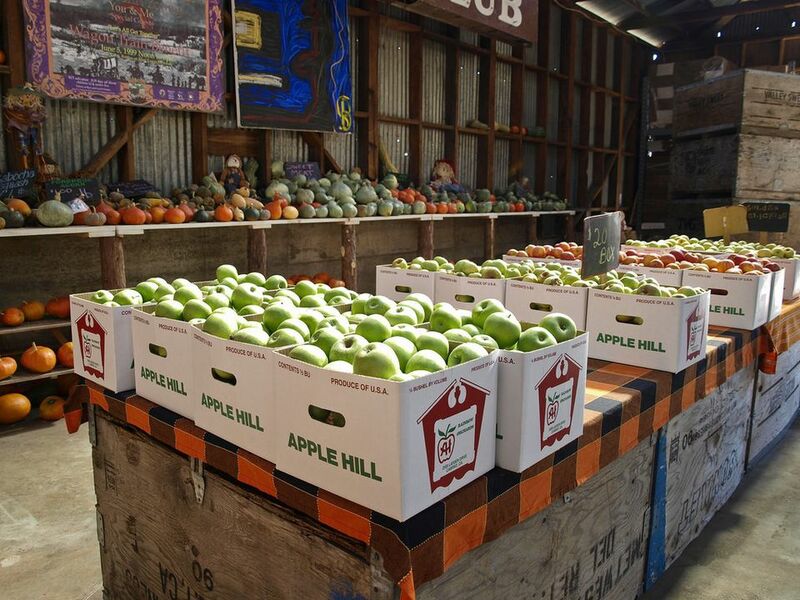 Apple Hill is located in the western Sierra Foothills in El Dorado County. Just an hour’s drive from downtown Sacramento, this locale is filled with fruit orchards, breweries, tree farms, and wineries. It's a perfect out-of-town spot for a quick countryside getaway. Apple Hill is an easy hour-long drive east of Sacramento. Head out of Sacramento on eastbound US-50 toward Lake Tahoe. As you pass Placerville, you’ll start to see several Apple Hill exit signs: the Schnell School Exit 48, Carson Road Exit, Camino Exit, Cedar Grove Exit 54, and Pollock Pines Exit 57. If you are unfamiliar with area roads, make sure to print out the maps provided by the Apple Hill Growers Association. Keep in mind that driving the scenic roads in Apple Hill can be beautiful, but don’t forget to watch the road. Some of them have sharp turns that can hide some oncoming traffic if you aren’t careful. During peak season in October, there’s a free shuttle bus service on the weekends. You can drop off your car at one of the two shuttle stops: one is at the corner of the Schnell School Exit 48 and Carson Road, and the second is near the Cedar Grove Exit 54 and Eight Mile Road. The name Apple Hill is a dead giveaway for what this place is known for: apples. Visitors can either enjoy picking their own apples from the tree or from a convenient container. Among the variety of apples available are Golden Delicious, Granny Smith, Pippen, Pink Lady, Rome Beauty, Fuji, Gala, and Mutsu, just to name a few. Pears like Bartlett and Bosc, pumpkins, cherries, grapes, plums, and persimmons are also grown in farms around the area. Don’t miss the famed apple milkshakes at High Hill and the apple cider doughnuts at Rainbow Orchards. A popular spot to pick your perfect apple is Boa Vista Orchards (#3 on the Apple Hill Growers map). You can find freshly picked tart Gravenstein apples, sweet Cameos, and crisp Braeburns at Boa Vista Orchards. The friendly staff also offers free samples if you’re not sure what kind of apple to get. While you’re there, try the homemade apple pie, applesauce, fruit butter, apple wine, and fruit jelly. This busy, large roadside stand also has arts and crafts vendors, a grocery store, and a quick counter serving food and hot pies. Another key attraction to Apple Hill, especially during the Thanksgiving holiday, are the Christmas tree farms. The different varieties of trees grown in the area include noble fir, Douglas fir, Shasta fir, silver tip, white fir, Canaan fir, swift river, cedar, and Sequoia. For this and other reasons, Indian Rock Tree Farm is a hidden gem. As they are members of the Christmas Tree Growing Association and not with the Apple Hill Growers Association, you won’t find them on the popular map. Once you pull up into the parking lot, you’ll find a small hill full of newly-cut trees and very friendly and helpful staff who will give you a choice: You can either park right there and shop for a cut tree or follow a staffer’s direction to drive down the lot, over the tiny bridge, and up the path to a clearing in the forest, where you’ll see thousands of trees just waiting to be picked. They have an array of firs as well as cedar. Unlike other tree farms, Indian Rock charges by the foot. Once you pick your tree, reward yourself with hot apple cider or hot cocoa. After footing up and down a hill to find your holiday tree or browsing aisle after aisle for jars of fruit preserves, the pangs of hunger will hit you. So head on over to Abel’s Apple Acres (#38 on the Apple Hill Growers map) for food, fudge, and family fun. This is a favorite eating and resting spot for many Apple Hill visitors in the fall, as evidenced by the lack of parking spaces on most days between Labor Day and Christmas Eve. You can fill your belly in more ways than one at Abel’s. At the quick service counter, pick up a plate of barbecue or garlic fries. To satisfy your sweet tooth, reach for one of the many types of caramel apples, homemade pies, and fudge. Once you’re done eating, take the path leading down to the pony ride, hay maze, and pumpkin patch as well as wooden cutouts perfect for cute photo opportunities.